BACKGROUND: Overweight and obesity are prevalent among young women and are greater among minority and low-income women. The postpartum period is critical in women's weight trajectories as many women do not lose their pregnancy weight, and others lose some and then plateau or experience weight gain. Excess weight puts women at greater risk of chronic disease and thus weight loss in the postpartum period may be key to the long-term health of young women. 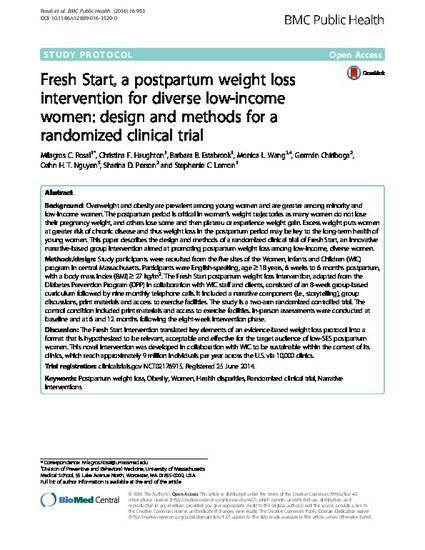 This paper describes the design and methods of a randomized clinical trial of Fresh Start, an innovative narrative-based group intervention aimed at promoting postpartum weight loss among low-income, diverse women. METHODS/DESIGN: Study participants were recruited from the five sites of the Women, Infants and Children (WIC) program in central Massachusetts. Participants were English-speaking, age > /= 18 years, 6 weeks to 6 months postpartum, with a body mass index (BMI) > /= 27 kg/m(2). The Fresh Start postpartum weight loss intervention, adapted from the Diabetes Prevention Program (DPP) in collaboration with WIC staff and clients, consisted of an 8-week group-based curriculum followed by nine monthly telephone calls. It included a narrative component (i.e., storytelling), group discussions, print materials and access to exercise facilities. The study is a two-arm randomized controlled trial. The control condition included print materials and access to exercise facilities. In-person assessments were conducted at baseline and at 6 and 12 months following the eight-week intervention phase. DISCUSSION: The Fresh Start intervention translated key elements of an evidence-based weight loss protocol into a format that is hypothesized to be relevant, acceptable and effective for the target audience of low-SES postpartum women. This novel intervention was developed in collaboration with WIC to be sustainable within the context of its clinics, which reach approximately 9 million individuals per year across the U.S. via 10,000 clinics. TRIAL REGISTRATION: clinicaltrials.gov NCT02176915. Registered 25 June 2014.